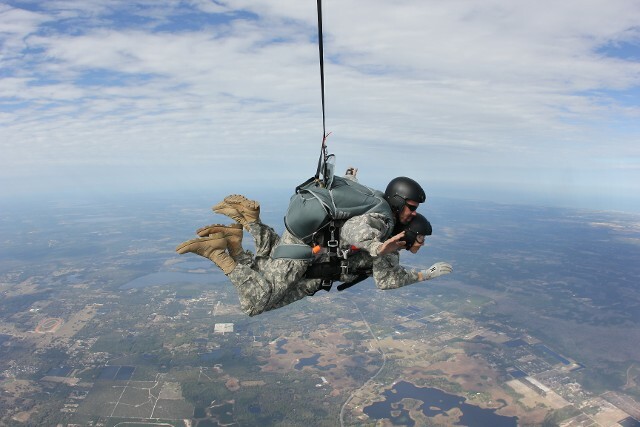 Ballenger International, LLC have strategically teamed with Parachute Laboratories, Inc. to provide personnel parachute systems. 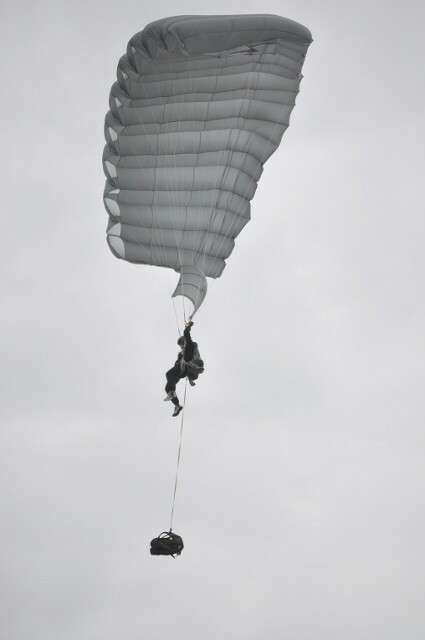 Additionally, we have joined with several other key manufactures within the parachute industry to provide you with every piece of equipment required to ensure success of your missions and to ensure the integration of all the equipment provided. Please contact us for brochures and specifications on any products listed. The Racer H/C does not have recalls for failures as many other rigs do. 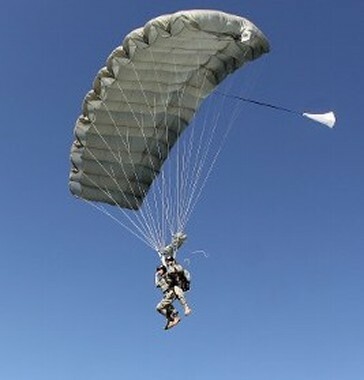 The U.S. Parachute Association in conjunction with the Parachute Industry Association in early 2010 issued a Safety Advisory telling skydivers to bring their H/C's to their respective riggers to have the reserve bag extraction force(s) tested. The reason for this is because in the last 3 or so years there have been some 8 fatalities in the U.S. alone (not to mention others in Europe and elsewhere), where 1-pin type rigs have failed to release the reserve following AAD firing or reserve ripcord pull. These rigs suffer from poor reserve container designs and/or low drag pilotchutes that do not generate enough force to pull the bags from the restrictive containers. 1. The reserve ripcord pins are completely protected, because they are on the backpad of the rig, protected not only by a pin protector flap, but by the wearer! 2. Because the reserve container has two pins, the reserve pilotchute cannot be rotated, making it tamper-proof and the ripcord pull force is reduced because of the distribution of the load between two pins instead of one. 3. Adjustable closing loops make reserve packing and closing a cinch! (Very easily done). 4. The NASA-tested Racer Reserve pilotchute has a drag coefficient of .85. No other reserve pilotchute comes close. 5. 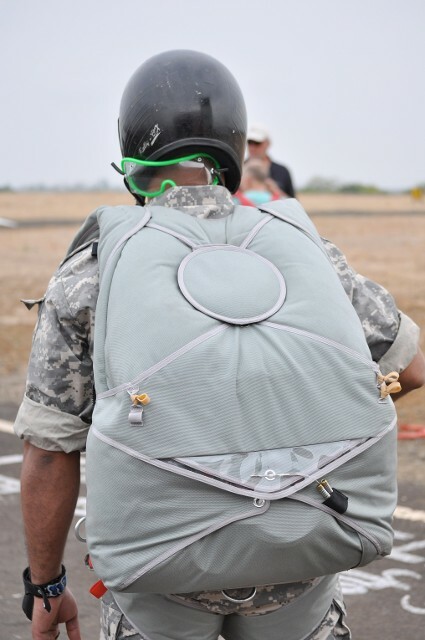 The reserve deployment bag (“Freebag”), has a 3-inch wide bridle, making it the highest drag bridle in the world. 6. Unboxed upper reserve tray, and boxed lower reserve tray to ensure proper bag orientation during deployment regardless of body position. 7. All of the above result in the fastest reserve deployment with or without RSL! 8. An important fact is; we routinely manufacture harnesses for a huge variety of human frames (from very small to very large). Parachute Labs is the only company that offers (off the shelf) FIVE over the shoulder sizes to accommodate different thicknesses of people. Soldiers at the extreme range of harness sizes will not have to suffer harness/container systems that do not fit properly. 9. Type 13 webbing used in the harness construction make the Racer Harness the strongest and the most comfortable. Type 13 is 7500 pounds tensile strength vs. Type 7 with only 6500 pound tensile. The thicker Type 13 with its extra body, distributes the weight of the jumper more effectively. Type 13 doesn’t slip in any of the hardware in current use. 10. Extendable Non-Compressible Cutaway Housings ensure simultaneous cutaway within ½”. This is critical if a high speed, spinning malfunction is encountered. 11. Proprietary Teflon cable is used in the manufacture of all cutaway handle/cable assemblies. 12. The main closing loop anchor emanates from the floor of the container tray, making it non-snag-able. Other manufacturers sew a tab to the top of the vertical partition of their rigs. Main connector lines have often half hitched around these tabs causing malfunctions that can be difficult or impossible to cut away. 13. All the container grommets are stainless steel and not simply nickel plated brass.